The vaccination has much profit for an infectious disease. On the other hand, there is little frequency, side effects may appear. It includes severe complication. We reported the case that resulted in bilateral acute profound hearing loss after mumps alone and measles and rubella (MR) vaccination. The case was a 5 years old girl. She inoculated mumps alone and MR vaccine. After 18days later, both sides profound hearing loss occurred in her. The hearing loss was not improved by the intravenous feeding of the steroid. Three months later, cochlea implantation was carried out to her right ear. She got hearing again. As for the hearing loss, mumps vaccine was considered as a cause from a latency period until the onset. The bilateral profound hearing loss that was a very rare complication was occurred by vaccination. The care of the hearing is important, but the mental care of an affected child and the parent is important, too. Vaccination induces acquired immunity against infectious diseases caused by viruses and bacteria, through which infections are prevented or the severity of symptoms and complications are strongly suppressed even if infection occurs. Many infectious diseases prevented by vaccination are serious, such as no effective treatment method is available or the mortality or frequency of remaining sequelae is high. Another significance of vaccination is elimination of disease or prevention of outbreaks of infection by vaccinating the majority. Although it has many benefits as described above, side reactions may develop in a small number of vaccinated persons. Even though vaccination induces symptoms of infection, these spontaneously improve in most cases when symptoms are mild, but it may be serious in rare cases, resulting in vaccine-induced lifelong sequelae. We encountered a patient who developed bilateral acute severe sensorineural hearing loss after receiving simultaneous administration of mumps vaccine and mixed MR vaccine. We report the case. The patient was a 5-year-old girl with a past medical history of febrile convulsion at one year old with no particular familial medical history. At one year old, she received simultaneous administration of varicella vaccine and mumps vaccine (first shot). The patient received mumps vaccine (Takeda G6-4 Torii strain) and mixed MR vaccine (Takeda Y197) at a pediatric clinic. After 12 days, fever higher than 39°C developed only for one day, she vomited once on the following day, and loss of appetite was also noted, but the symptoms remitted. Her grandmother noticed poor hearing of the child 18 days after vaccination and she was brought to the pediatric emergency service of our hospital on the following day, which was a holiday. Consultation with the otorhinolaryngology department was instructed and she was brought to our department 20 days after vaccination. No vertigo was complained of, and hearing loss was the only symptom. Conversation was difficult due to hearing loss, and communication by writing was also difficult because she could read only some letters. On the first examination, the tympanic findings were normal, the bilateral ears were type A on tympanometry, sensorineural hearing loss at 100 dBHL or higher was observed in the bilateral ears on pure tone audiometry, and no reaction was detected on DPOAE in either ear. 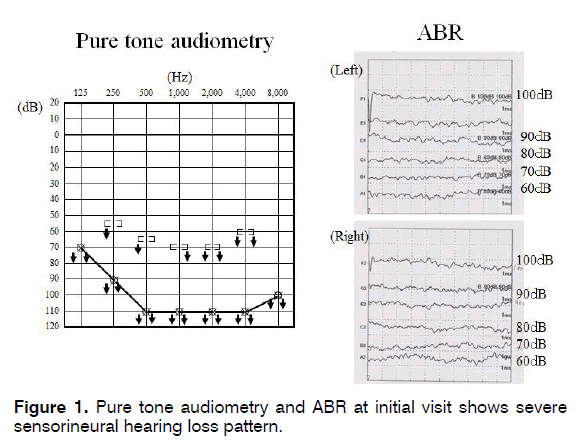 ABR was also performed on the first examination, but V-waves were absent at 100 dB in the bilateral ears, showing a pattern of severe hearing loss. CT of the temporal bone and MRI of the inner ear were performed on a subsequent day, but no significant imaging finding was noted. Since the history of vaccination was not heard on the first interview, a detailed interview was performed after confirming hearing loss on ABR. Based on the fact that she received vaccination about 3 weeks before the hospital visit, she was diagnosed with bilateral acute sensorineural hearing loss associated with a side reaction of the vaccine. She was admitted on the following day after examination and treated with steroid infusion therapy in a tapering regimen (tapering from 20 mg prednisolone), but the condition did not improve. Wearing a hearing aid was initiated immediately after discharge, but its effect was poor. We explained to her parents that surgical treatment with cochlea implant is available when no hearing aid effect is observed after 3 months. At the same time, we prepared an Adverse Event (AE) sheet and report to Pharmaceutical and Medical Device Agency (PMDA) as a side reaction of vaccine. We also prepared a report on the vaccine side reaction for submission to the government office for the patient to obtain a certificate for the side reaction of vaccine and apply for public expense. ABR was repeated after 3 months to apply for a physical disability certificate, on which a pattern of severe hearing loss was observed in the bilateral ears, confirming that hearing loss did not improve. Right cochlear implantation was performed after explanation to and obtaining consent from the parents. The postoperative course was smooth. Mapping was performed and activation was favorable. Currently, she goes to a regular class of a primary school and to a hearing-impaired class once a week. She is able to communicate by conversation using cochlea implants (Figures 1-3). Figure 1: Pure tone audiometry and ABR at initial visit shows severe sensorineural hearing loss pattern. 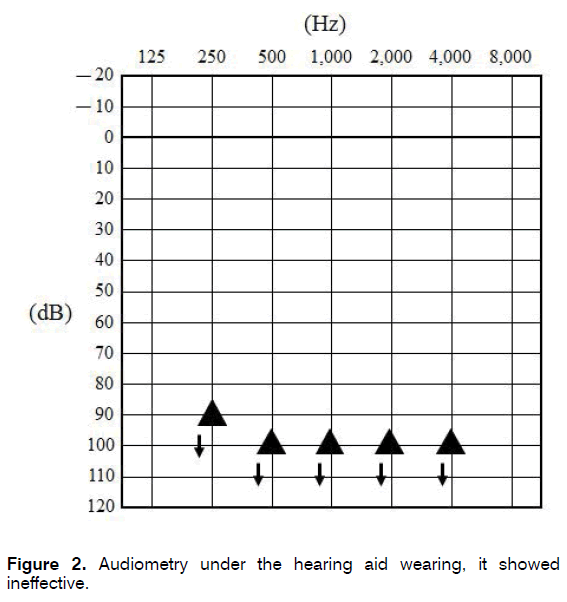 Figure 2: Audiometry under the hearing aid wearing, it showed ineffective. 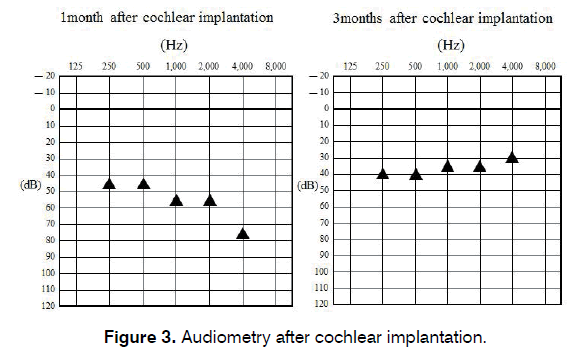 Figure 3: Audiometry after cochlear implantation. There was no other symptom or finding inducing the disease in this patient, and bilateral acute severe sensorineural hearing loss developed about 3 weeks after vaccination, suggesting that hearing loss was caused by vaccine side reaction. Regarding severe hearing loss of the bilateral ears caused by vaccine side reaction in other countries, Brodyshy  and Gracia  reported cases of encephalitis and hearing loss after MMR vaccination. In Japan, Koga  reported a case of severe hearing loss of the bilateral ears following development of acute cerebellar ataxia-associated gait disorder which developed after MMR vaccination. Cases of unilateral hearing loss considered a side reaction of mumps vaccine have also been reported [4,5]. Generally, the incubation period of natural measles/rubella virus infection is about 2 weeks, and that of mumps virus is about 2-3 weeks. Measles vaccine was considered the cause based on the incubation period in the case reported by Brodsky, and mumps virus may have been the cause in the case reported by Koga and in our patient. We considered a cerebrospinal fluid test to identify the cause and γglobulin administration as a treatment, but we did not perform these because there was no clinical symptom other than hearing loss and even if mumps is definitely diagnosed, it does not directly lead to treatment. Therefore, it was undesirable to place a burden on the patient. Mumps vaccine is a live vaccine. It has a high affinity to the center and the frequency of inducing aseptic meningitis as a side reaction is higher than those of other vaccines. Since the blood-inner ear barrier is immature so as the blood-brain barrier in infants, hearing loss may be easily caused by mumps virus. Other symptoms, such as encephalitis, developed in other reported cases, but only fever and nausea developed for only one day and no other symptoms developed in our patient, being a rare case. Unfortunately, the side reaction of the vaccine caused serious hearing loss in this patient, but We have no objection against recommendation of vaccination because when the risk of hearing loss caused by the side reaction of the vaccine and the risk of hearing loss and complications, such as aseptic meningitis, caused by natural mumps infection are compared, vaccination to acquire immunity has less risk of complication. The incidence of hearing loss caused by natural mumps infection has been reported to be 1/1,000- 20,000 [6,7], and the risk of vaccine-induced hearing loss was estimated to be about 1/6-8 million people on a mumps MMR vaccine survey . In view of these reports, although vaccination should be recommended, development of a vaccine with a low frequency of inducing complication is desired. In the present patient, cochlear implantation was performed in the right ear because hearing ability did not recover after 3-month course observation. Auditory sense was re-acquired by cochlea implantation, and after mapping, an effect sufficient for daily life was acquired. Cochlea implantation is very significant for acquired hearing loss. Affected children are anxious because they became unable to hear immediately after the onset and suddenly lost communication through conversation. Their parents are also anxious seeing that their children suddenly became unable to hear and feel guilty that they decided on vaccination of their children. In the present case, psychological care was performed for the parents and patient involving the pediatric department, and it was explained to the parents that very rare side reaction incidentally occurred and they were not responsible for it. Active care is necessary for not only auditory but also psychological aspects. In addition, it is necessary to cooperate with the governmental office socially for application of certificate for vaccine side reaction so that the patient can receive not only medical assistance but also public aid. We encountered a child who developed bilateral acute serious hearing loss after receiving simultaneous administration of mumps vaccine and MR vaccine. Based on the incubation period, mumps vaccine was considered the cause. After hearing loss, favorable auditory compensation by cochlea implantation was achieved. For unfortunate side reactions, not only medical care of side reactions but also psychological and social cares with active involvement of physicians are necessary. There is no conflict of interest in this report. Brodsky L, Stanievich J. Sensorineural hearing loss following live measles virus vaccination. Int J Pediat Otorhinolaryngol. 1990;10:159-63. García Callejo FJ, Costa Alcácer I, de Paula Vernetta C, Marco Algarra J. Sudden bilateral deafness after measles, mumps and rubella vaccination. An Pediatr(Barc). 2005;62:482-3. Koga K, Kawashiro N, Araki A, Watanabe M. Bilateral acute profound deafness after MMR vaccination. Nihon Jibiinkoka Gakkai Kaiho. 1999;94:1142-5. Nabe-Nielsen J, Walter B. Unilateral total deafness as a complication of the meales-mumpus-rubela vaccination. Scand Audiol Suppl. 1988;30:69-70. Kaga K, Ichimura K, Ihara M. Unilateral total loss of auditory and vestibular function as a complication of mumps vaccination. Int J Pediat Otorhinolaryngol. 1998;43:73-5. Everberg G. Deafness following mumps. Acta Otolaryngol. 1957;48:397-403. Hashimoto H, Fujioka M, Kinumaki H. An office-based prospective study of deafness in mumps. Pediatr Infect Dis J. 2009;28:173-5. Asatryan A, Pool V, Chen RT, Kohl KS, Davis RL, Iskander JK, et al. Live attenuated measles and mumps viral strain-containing vaccines and hearing loss, Vaccine Adverse Event Reporting System (VAERS) United States 1990-2003. Vaccine. 2008;26:1166-72. Paper submitted to the ITJ-EM (Editorial Manager System) on February 22, 2018; and accepted on March 05, 2018.